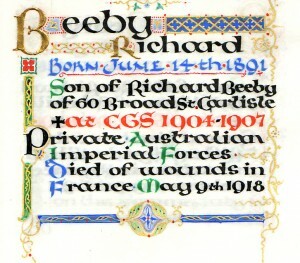 Richard was the elder son of Richard and Jane Alice Beeby (nee Johnston), both of Carlisle. His father was a commercial clerk and his mother was the daughter of a builder. Richard Beeby Senior died in 1909; in his will he left £730 1s, quite a substantial sum. Richard left for Australia at the age of 21 in 1913, aboard the Scharnhorst travelling from Antwerp to Sydney. His brother John went on to serve with the Border Regiment in India.